Iwo Jima was one of those rare amphibious landings where the assault troops could clearly see the value of the objective. They were the first ground units to approach within a thousand miles of the Japanese homeland, and they were participating directly in the support of the strategic bombing campaign. The latter element represented a new wrinkle on an old theme. For 40 years the U.S. Marines had been developing the capability for seizing advanced naval bases in support of the fleet. Increasingly in the Pacific Warand most especially at Saipan, Tinian, and now Iwo Jimathey were seizing advanced airbases to further the strategic bombing of the Japanese home islands. American servicemen had awaited the coming of the B-29s for years. The "very-long-range" bombers, which had become operational too late for the European War, had been striking mainland Japan since November 1944. Results proved disappointing. The problem stemmed not from the pilots or planes but rather from a vexing little spit of volcanic rock lying halfway along the direct path from Saipan to TokyoIwo Jima. Iwo's radar gave the Japanese defense authorities two hours advance notice of every B-29 strike. Japanese fighters based on Iwo swarmed up to harass the unescorted Superforts going in and especially coming home, picking off those bombers crippled by antiaircraft (AA) fire. As a result, the B-29s had to fly higher, along circuitous routes, with a reduced payload. At the same time, enemy bombers based on Iwo often raided B-29 bases in the Marianas, causing some damage. The Joint Chiefs of Staff decided Iwo Jima must be captured and a U.S. airbase built there. This would eliminate Japanese bombing raids and the early warning interceptions, provide fighter escorts throughout the most dangerous portion of the long B-29 missions, and enable greater payloads at longer ranges. Iwo Jima in American hands would also provide a welcome emergency field for crippled B-29s returning from Tokyo. It would also protect the flank of the pending invasion of Okinawa. In October 1944 the Joint Chiefs directed Fleet Admiral Chester W. Nimitz, CinCPac, to seize and develop Iwo Jima within the ensuing three months. This launched Operation Detachment. The first enemy in the campaign would prove to be the island itself, an ugly, barren, foul-smelling chunk of volcanic sand and rock, barely 10 square miles in size. Iwo Jima means "Sulphur Island" in Japanese. As described by one Imperial Army staff officer, the place was "an island of sulphur, no water, no sparrow, no swallow." 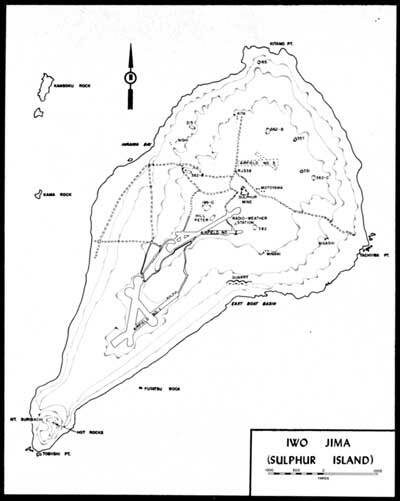 Less poetic American officers saw Iwo's resemblance to a pork chop, with the 556-foot dormant volcano Mount Suribachi dominating the narrow southern end, overlooking the only potential landing beaches. To the north, the land rose unevenly onto the Motoyama Plateau, falling off sharply along the coasts into steep cliffs and canyons. The terrain in the north represented a defender's dream: broken, convoluted, cave-dotted, a "jungle of stone." Wreathed by volcanic steam, the twisted landscape appeared ungodly, almost moon-like. More than one surviving Marine compared the island to something out of Dante's Inferno. Forbidding Iwo Jima had two redeeming features in 1945: the military value of its airfields and the psychological status of the island as a historical possession of Japan. Iwo Jima lay in Japan's "Inner Vital Defense Zone" and was in fact administered as part of the Tokyo Prefecture. In the words of one Japanese officer, "Iwo Jima is the doorkeeper to the Imperial capital." Even by the slowest aircraft, Tokyo could be reached in three flight hours from Iwo. In the battle for Iwo Jima, a total of 28,000 Americans and Japanese would give their lives in savage fighting during the last winter months of 1945. No one on the American side ever suggested that taking Iwo Jima would be an easy proposition. Admiral Nimitz assigned this mission to the same team which had prevailed so effectively in the earlier amphibious assaults in the Gilberts, Marshalls, and Marianas: Admiral Raymond A. Spruance, commanding the Fifth Fleet; Vice Admiral Richmond Kelly Turner, commanding the Expeditionary Forces; and Rear Admiral Harry W. Hill, commanding the Attack Force. Spruance added the highly regarded Rear Admiral William H. P. Blandy, a veteran of the Peleliu/Angaur landings, to command the Amphibious Support Forces, responsible for minesweeping, underwater demolition team operations, and preliminary naval air and gun bombardment. As usual, "maintaining unremitting military pressure on the enemy" meant an accelerated planning schedule and an overriding emphasis on speed of execution. The amphibious task force preparing to assault Iwo Jima soon found itself squeezed on both ends. Hill and Blandy had a critical need for the amphibious ships, landing craft, and shore bombardment vessels currently being used by General Douglas MacArthur in his reconquest of Luzon in the Philippines. But bad weather and stiff enemy resistance combined to delay completion of that operation. The Joint Chiefs reluctantly postponed D-day for Iwo Jima from 20 January 1945 until 19 February. The tail end of the schedule provided no relief. D-Day for Okinawa could go no later than 1 April because of the approach of the monsoon season. The constricted time frame for Iwo would have grave implications for the landing force. The experienced V Amphibious Corps under Major General Harry Schmidt, USMC, would provide the landing force, an unprecedented assembly of three Marine divisions, the 3d, 4th, and 5th. Schmidt would have the distinction of commanding the largest force of U.S. Marines ever committed in a single battle, a combined force which eventually totalled more than 80,000 men. Well above half of these Marines were veterans of earlier fighting in the Pacific; realistic training had prepared the newcomers well. The troops assaulting Iwo Jima were arguably the most proficient amphibious forces the world had seen. Unfortunately, two senior Marines shared the limelight for the Iwo Jima battle, and history has often done both an injustice. Spruance and Turner prevailed upon Lieutenant General Holland M. Smith, then commanding Fleet Marine Forces, Pacific, to participate in Operation Detachment as Commanding General, Expeditionary Troops. This was a gratuitous billet. Schmidt had the rank, experience, staff, and resources to execute corps-level responsibility without being second-guessed by another headquarters. Smith, the amphibious pioneer and veteran of landings in the Aleutians, Gilberts, Marshalls, and Marianas, admitted to being embarrassed by the assignment. "My sun had almost set by then," he stated, "I think they asked me along only in case something happened to Harry Schmidt." Smith tried to keep out of Schmidt's way, but his subsequent decision to withhold commitment of the 3d Marines, the Expeditionary Troops reserve, remains as controversial today as it was in 1945. Holland Smith was an undeniable asset to the Iwo Jima campaign. During the top-level planning stage he was often, as always, a "voice in the wilderness," predicting severe casualties unless greater and more effective preliminary naval bombardment was provided. He diverted the press and the visiting dignitaries from Schmidt, always providing realistic counterpoints to some of the rosier staff estimates. "It's a tough proposition," Smith would say about Iwo, "That's why we are here." I was the commander of all troops on Iwo Jima at all times. Holland Smith never had a command post ashore, never issued a single order ashore, never spent a single night ashore . . . . Isn't it important from an historical standpoint that I commanded the greatest number of Marines ever to be engaged in a single action in the entire history of the Marine Corps? General Smith would not disagree with those points. Smith provided a useful role, but Schmidt and his exceptional staff deserve maximum credit for planning and executing the difficult and bloody battle of Iwo Jima. The V Amphibious Corps achievement was made even more memorable by the enormously difficult opposition provided by the island and the enemy. In Lieutenant General Tadamichi Kuribayashi [see sidebar], the Americans faced one of the most formidable opponents of the war. A fifth-generation samurai, hand picked and personally extolled by the Emperor, Kuribayashi combined combat experience with an innovative mind and an iron will. Although this would be his only combat against American forces, he had learned much about his prospective opponents from earlier service in the United States. More significantly, he could appraise with an unblinking eye the results of previous Japanese attempts to repel American invasions of Japanese-held garrisons. Heroic rhetoric aside, Kuribayashi saw little to commend the "defend-at-the- water's-edge" tactics and "all-or-nothing" Banzai attacks which had characterized Japan's failures from Tarawa to Tinian. Kuribayashi, a realist, also knew not to expect much help from Japan's depleted fleet and air forces. His best chances, he concluded, would be to maximize Iwo's forbidding terrain with a defense in depth, along the pattern of the recent Biak and Peleliu defensive efforts. He would eschew coast defense, anti-landing, and Banzai tactics and instead conduct a prolonged battle of attrition, a war of nerves, patience, and time. Possibly the Americans would lose heart and abandon the campaign. Such a seemingly passive policy, even that late in the war, seemed revolutionary to senior Japanese Army and Navy leaders. It ran counter to the deeply ingrained warrior code, which viewed the defensive as only an unpleasant interim pending resumption of the glorious offensive in which one could destroy the enemy with sword and bayonet. Even Imperial General Headquarters grew nervous. There is some evidence of a top-level request for guidance in defending against American "storm landings" from Nazi Germany, whose sad experience in trying to defend Normandy at the water's edge had proven disastrous. The Japanese remained unconvinced. Kuribayashi needed every bit of his top connections with the Emperor to keep from being summarily relieved for his radical proposals. His was not a complete organizational victorythe Navy insisted on building gun casemates and blockhouses along the obvious landing beaches on Iwobut in general he prevailed. Kuribayashi demanded the assistance of the finest mining engineers and fortifications specialists in the Empire. Here again, the island favored the defender. Iwo's volcanic sand mixed readily with cement to produce superior concrete for installations; the soft rock lent itself to rapid digging. Half the garrison lay aside their weapons to labor with pick and spade. When American heavy bombers from the Seventh Air Force commenced a daily pounding of the island in early December 1944, Kuribayashi simply moved everythingweapons, command posts, barracks, aid stationsunder ground. These engineering achievements were remarkable. Masked gun positions provided interlocking fields of fire, miles of tunnels linked key defensive positions, every cave featured multiple outlets and ventilation tubes. One installation inside Mount Suribachi ran seven stories deep. The Americans would rarely see a live Japanese on Iwo Jima until the bitter end. American intelligence experts, aided by documents captured in Saipan and by an almost daily flow of aerial photography (and periscope-level pictures from the submarine Spearfish), puzzled over the "disappearing act" of the Japanese garrison. Trained photo interpreters, using stereoscopic lenses, listed nearly 700 potential targets, but all were hardened, covered, masked. The intelligence staffs knew there was no fresh water available on the island. They could see the rainwater cisterns and they knew what the average monthly rainfall would deliver. They concluded the garrison could not possibly survive under those conditions in numbers greater than 12,000 or 13,000. But Kuribayashi's force was twice that size. The men existed on half-rations of water for months before the battle began. Unlike earlier amphibious assaults at Guadalcanal and Tarawa, the Americans would not enjoy either strategic or tactical surprise at Iwo Jima. Japanese strategists concluded Iwo Jima would be invaded soon after the loss of the Marianas. 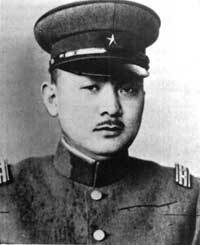 Six months before the battle, Kuribayashi wrote his wife, "The Americans will surely invade this Iwo Jima . . . do not look for my return." He worked his men ruthlessly to complete all defensive and training preparations by 11 February 1945and met the objective. His was a mixed force of veterans and recruits, soldiers and sailors. His artillerymen and mortar crews were among the best in the Empire. Regardless, he trained and disciplined them all. As the Americans soon discovered, each fighting position contained the commander's "Courageous Battle Vows" prominently posted above the firing apertures. Troops were admonished to maintain their positions and exact 10 American lives for every Japanese death. General Schmidt issued VAC Operation Plan 5-44 on 23 December 1944. The plan offered nothing fancy. Mount Suribachi dominated both potential beaches, but the 3,000 yards of black sand along the southeastern coast appeared more sheltered from the prevailing winds. Here the V Amphibious Corps would land on D-day, the 4th Marine Division on the right, the 5th on the left, the 3d in reserve. The initial objectives included the lower airfield, the west coast, and Suribachi. Then the force would swing into line and attack north, shoulder to shoulder. Anticipation of a major Japanese counterattack the first night influenced the landing plan. "We welcome a counterattack," said Holland Smith, "That's generally when we break their backs." 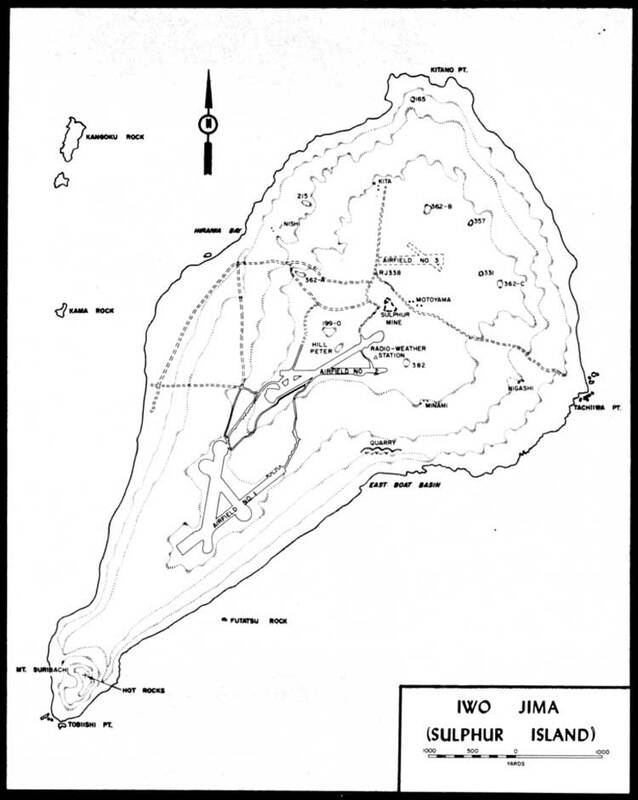 Both Schmidt and 4th Marine Division commander Major General Clifton B. Cates knew from recent experience at Tinian how capable the Japanese were at assembling large reserves at potential soft points along a fresh beachhead. The assault divisions would plan to land their artillery regiments before dark on D-day in that contingency. In the estimation of Lieutenant Colonel Justice M. Chambers, USMC, a battalion commander (3/25) whose four days ashore resulted in the Purple Heart and the Medal of Honor: "On Iwo Jima, one of their smartest generals commanded, a man who did not believe in the Banzai business; each Jap was to kill ten Marinesfor awhile they were beating their quotas." Chambers was describing Lieutenant General Tadamichi Kuribayashi, Imperial Japanese Army, Commanding General, 109th Division and Commander, Ogasawara Army Group. The U.S. Marines have rarely faced a tougher opponent. Kuribayashi, 53, a native of Nagano Prefecture, had served the Emperor as a cavalry officer since graduating from the Military Academy in 1914. He spent several years as a junior officer posted to the Japanese Embassies in America and Canada. With the advent of war in Asia, Kuribayashi commanded a cavalry regiment in combat in Manchuria and a brigade in northern China. Later, he served as chief of staff of the Twenty-third Army during the capture of Hong Kong. Favored by the Emperor, he returned from China to command the Imperial Guards Division in Tokyo. After the fall of Saipan in June 1944, he was assigned to command the defensive fortress of Iwo Jima. Kuribayashi was a realist. He saw Iwo Jima's crude air strips as a net liability to the Empire, at best providing nuisance raids against the B-29s, certain to draw the attention of American strategic planners. Iwo Jima's airfields in American hands would pose an enormous threat to Japan. Kuribayashi saw only two options: either blow up the entire island, which proved infeasible, or defend it to the death. To do the latter effectively he adapted a radical defensive policy, foregoing the water's-edge linear tactics and suicidal Banzai attacks of previous island battles. This stirred controversy at the highest levelsImperial Headquarters even asked the Nazis for advice on repelling American invasionsas well as among Kuribayashi's own officers. Kuribayashi made some compromises with the semi-independent naval forces on the island, but sacked 18 senior army officers, including his own chief of staff. Those who remained would implement their commander's policy to the letter. Doomed without naval or air support, Kuribayashi nevertheless proved to be a resolute and resourceful field commander. His only tactical error was to authorize the sector commander to engage the U.S. task force covering underwater demolitions team operations on D-2. This became a gift to the attackers, for it revealed to American gunners the previously masked batteries which otherwise would have slaughtered the assault waves on D-day. Japanese accounts indicate Kuribayashi committed hara kari, the Japanese ritual suicide, in his cave near Kitano Point on 23 March 1945, the 33d day of the battle. "Of all our adversaries in the Pacific," said General Holland M. Smith, USMC, "Kuribayashi was the most redoubtable." Said another Marine, "Let's hope the Japs don't have any more like him."